Back in the day, there was once a wonderful restaurant called Eppies on the downtown mall. It was my favorite lunch spot for a million reasons. 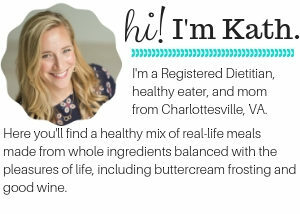 I loved the veg plate where you could order a combination of sides – a perfectly baked sweet potato, black beans, mac and cheese, steamed broccoli, pimento cheese grits (! ), collard greens, corn bread that tasted like cake, and pumpkin bread that always served as my dessert. Everything was so delicious, and it was perfect for sharing with a toddler. The second best thing at Eppies was the Santa Monica salad, which featured a bed of greens, corn cut off the cob, goat cheese, dates, cherry tomatoes, and a champagne dressing. Sadly, Eppies suddenly closed down a few years ago. We miss it so much! 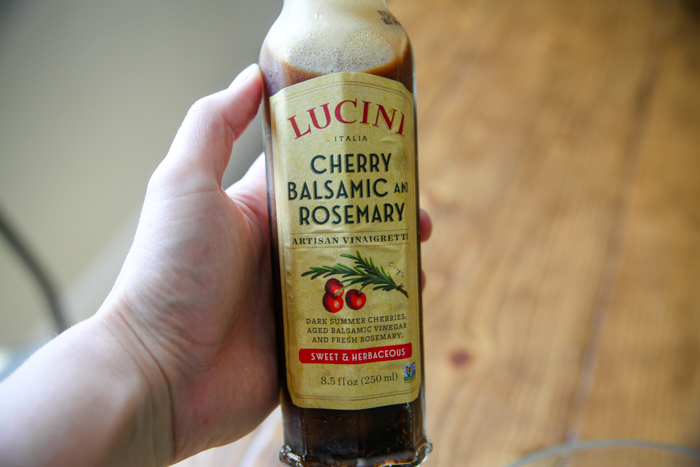 I am so picky about bottled dressings and often make my own, but my search continues for pre-made ones that are good. This one is good!! No gross onion-y bottle taste. 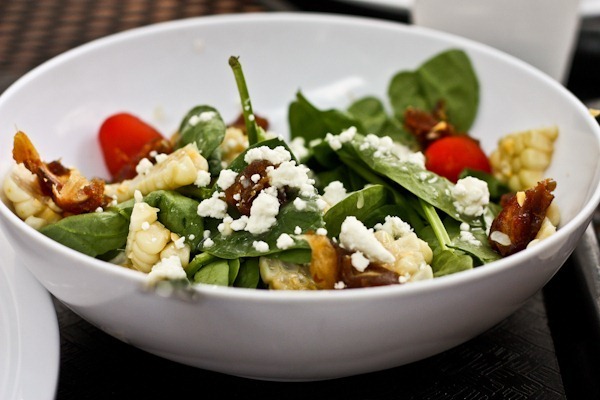 I share this summer salad in honor of Eppies, one of the greatest casual eateries Cville has ever had. 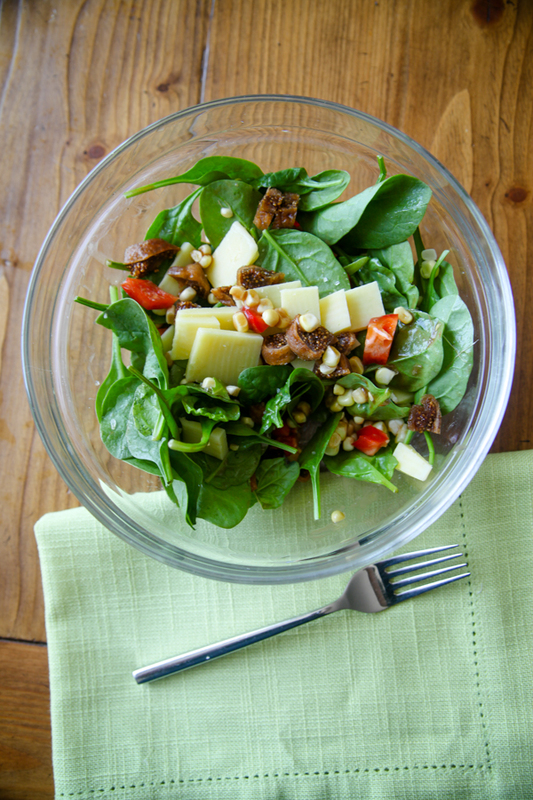 The combination of spinach, fresh corn, sharp cheese, a dried fruit, and a sweet-ish dressing is a winner! 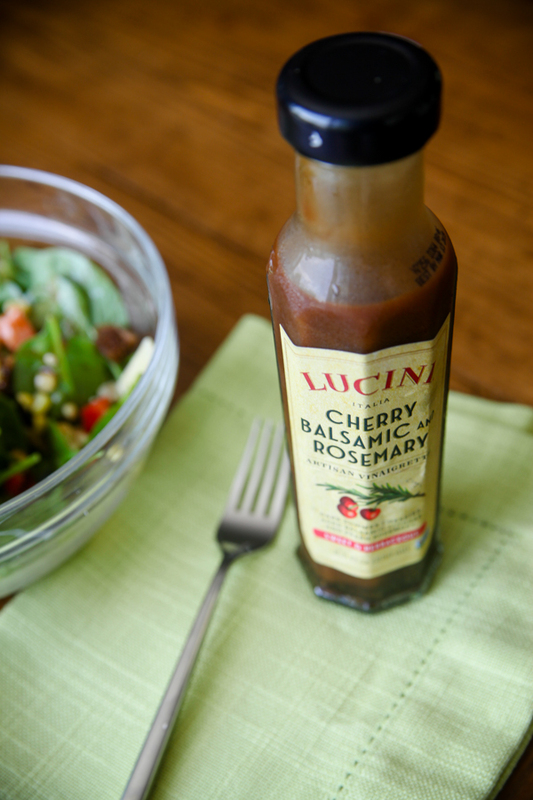 Tell me what your favorite summer salad topping has been of late! I miss Eppies and I miss Little Mazen. But big Mazen is lots of fun too. 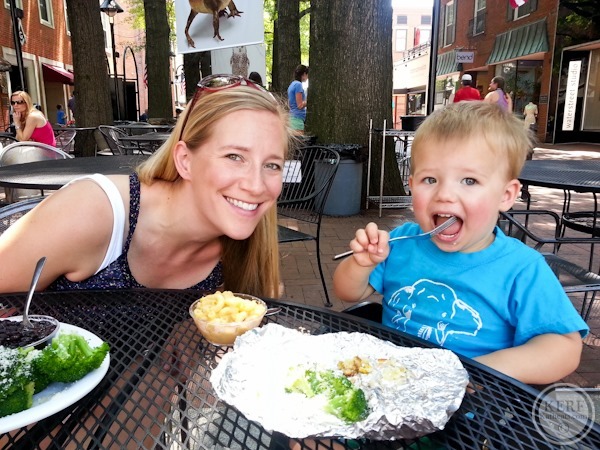 Kaci and I loved our meal at Eppie’s when we visited Cville for the second time! Their food was so delicious. It’s sad that they closed! 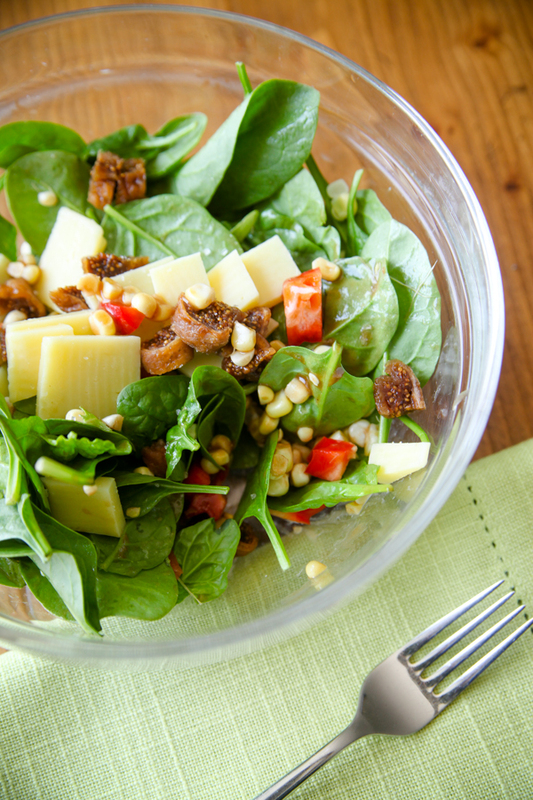 Thanks for sharing a fun, new salad combo. I’ve never had dried figs in a salad before. I’ll have to give it a try. This is sort of off topic, but you mentioned Survivor and it reminded me. Have you ever heard of DoCastaway? 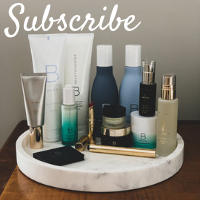 It seems like it might be right up your alley (after you have your baby and can leave him, of course). They do “vacations” in remote locations. They have a ton of different places to go with varying levels of isolation. Some of the locations have nice bungalows, some are shacks, some have nothing. Same with food – there are different options for that as well. It looks like a ton of fun, but also could be pretty challenging. I have not heard of that! I can’t say that I would choose to be isolated on an island if I weren’t with a group of people or on a show or competing somehow, but for years my friends and I have thought that they should do a survivor resort where the rooms are bare minimum and there are challenge courses and relics from the show! Agreed on dressings!!! There are some interesting new dressings at TJs in the refrigerated veggies area. I like the tumeric one, but also a carrot ginger and green goddess. My sister texted to alert me and I had already enjoyed them. Tessamae’s used to make an amazing French Vinagerette and I can’t find it now. Will get this one though, thanks for the tip! I might be in the minority but I can’t do fruit or dried fruit in savory foods. Lately i am still totally obsessed with kimchi! I keep making my own white kimchi which ferments in just a few days, so i am using lots of kimchi on salads. Other favorites include smoked tofu, hemp seeds, olives of any kind, lots of fresh herbs and of course avocado.